Sustainable, innovative wine processing solutions for TARTRATE STABILIZATION and pH ADJUSTMENT! 100% reliable TARTRATE STABILIZATION proven to enhance wine quality, save power, eliminate wine loss and reduce water usage. Welcome to OENODIA North America. OENODIA’S STARS (Selective Tartrate Removal System) and STARS ZeroWaste for TARTRATE STABILIZATION and pH ADJUSTMENT delivers a membrane-based technology, utilizing their exclusive Eletrodialysis technique, that safely and effectively removes wine tartrates, and has been proven to enhance wine quality, save power, eliminate wine loss, reduce water usage and works with very large volumes. Electrodialysis is the only process that can GUARANTEE 100% reliable TARTRATE STABILIZATION, whatever the color, quality or quantity of wine treated and regardless of storage conditions. STARS technology received a “Flex Your Power” award for innovation in energy savings from the California Energy Commission and utilizing the STARS systems qualifies customers for a significant PG&E utility rebate. OENODIA is the oenology division of Eurodia Industrie S.A, (France) one of the world's leading specialists in membrane-based treatments for the agri-food industry. OENODIA®, provides membrane based eco-processes used for tartaric stabilization, acidification, de-acidification, cross-flow filtration and de-alcoholization of wines. OENODIA’s exclusive STARS process can be acquired by purchasing STARS equipment directly or wineries can apply all the savings and the sustainable benefits by using the STARS Mobile Service which delivers immediate TARTRATE STABILIZATION & pH ADJUSTMENT to your winery door. A new OENODIA branch office, OENODIA NORTH AMERICA, opened in Napa in 2015. The location will provide direct support and service to the growing number of wineries utilizing the STARS (Specific Tartrate Removal System), STARS ZeroWaste and STARS Mobile Service. STARSguarantees immediate and permanent Tartrate stability of your wine, correlating to a strict standard of 6 days at 24.8°F /-4°C, with NO additives and with NO adverse effects on sensory characteristics. This is the result of Oenodia’s development of an innovative, novel and high-performance eco-process: Tartrate stabilization via Electrodialysis (ED). STARS, utilizing Electrodialysis, is the only technology that allows you to predict, mimic and or match your current cold stability regiment, in particular pH shift, whilst providing you with increased Tartrate stability. STARS ZeroWaste takes Tartrate stabilization one step further and reduces water consumption to about 1% to 2% of total wine stabilized, while allowing the separation and harvesting of the removed KHT. OENODIA is currently the only company in the world able to successfully apply this process to wine. The result is 100% reliable Tartrate stabilization (for at least 6 days at 24.8°F /-4°C), regardless of color, quality or storage conditions of the treated wine. STARS facilitates increased wine sales by guaranteeing wineries a fully tartrate stable product. It offers a high degree of agility, enabling fast and continuous treatment. Last but not least, it preserves the natural characteristics of the wine. Immediate Tartrate Stabilization: STARS is the only comprehensive process that combines a predictive test (DIT test) via STABILABto predict Tartrate stability and then delivers Tartrate stability in a single pass via STARS STABILAB is then used again to provide a specific stability verification test (ISTC50). Eliminates 1% to 2% of wine loss due to Tartrate slurry from cold stabilization. Stabilizes both Potassium and Calcium Tartrates. 96% less energy needed than refrigeration! ED 800 combined with Crossflow filter. Continuous microbial filtration and Tartrate Stabilization. Both units can be operated individually. Find out more about OENODIA STARS Mobile Services delivered right to the Winery door. STARS for Tartrate Stabilization, STARS pH for pH Adjustment and much more.. In their ongoing quest for sustainable, efficient wine processing solutions that can improve wine quality, an increasing number of winemakers are turning to the remarkable technology offered through Oenodia’s STARS Mobile Service for tartrate stabilization and pH adjustment. STARS Technology offers more than just stabilization to Sparkling Wine Producers – helps with disgorging, adjusting pH and lowering calcium! OENODIA, the oenology division of Eurodia Industrie SAS, one of the world’s leading specialists of membrane-based treatments for the global agri-food industry, has been providing the breakthrough STARS technology for wine producers for the last 20 years. STARS technology is not only well suited for red or white wines, but it also presents huge benefits for sparkling wines too which is why it has long been used by many sparkling wine producers worldwide. Such countries as Italy for Prosecco or Spain for CAVA and in the U.S. too, several top sparkling brands have been processing their wines with STARS technology for many years. The trend towards growth looks set to continue with the first OENODIA STARS XF being commissioned in Champagne, at MUMM’s historic facility in Reims, France, this month. STARS stands for Selective Tartrate Removal System. It refers to a membrane-based process, unique to OENODIA, that offers winemakers a controlled and measured extraction of potassium, calcium and tartrates from the wine prior to bottling. Winemakers have long lauded the OENODIA STARS technology for providing 100% guaranteed stability, with zero wine loss, measurable energy savings and without the addition of additives, while ensuring the complete removal of the tartrate crystals that many consumers find objectionable in the finished wine. Furthermore, in addition to these benefits, STARS technology can play a vital role in the sparkling wine process, as it enables you to lower overall pH and to effectively remove calcium. Indeed, calcium can cause headaches for winemakers long after the wine leaves production. Requillard notes that the beauty of STARS is a guaranteed reduction of calcium concentration, while simultaneously removing tartrates and potassium from the wine solution regarding standard potassium crystallization. He points out that the Mumm facility in France first implemented a STARS mobile service to confront the calcium issue on a trial basis. Among the reduction in wine loss from 1.5% to zero compared to chilling, they also realized another 1.5% wine savings by cutting down gushing while disgorging. Following the successful trials that were done over the past 3 years, Mumm management decided to invest in a STARS XF unit, the unique in-line combination between a STARS Stab unit and a crossflow filter to streamline their process. OENODIA is the exclusive developer of the STARS Line which features three cutting edge technologies that have revolutionized the global wine industry: STARS STAB, STARS pH and STARS XF. STARS STAB guarantees immediate and permanent tartrate stabilization via Electrodialysis (ED) with no additives and no adverse effects on sensory characteristics; STARS pH uses the innovative, membrane-based technology to allow you to dial in your pH, to adjust the pH in your wine and must naturally and with precision; STARS XF merges crossflow filtration with STARS to allow continuous filtration and stabilization of wine with no intermediate tank or multiple control function requirements, which facilitates rapid, automated processing. For more information on OENODIA and its groundbreaking STARS technology and its STARS Mobile Service, go to oenodia.us or stop by their BOOTH #2406 at the Unified Symposium in Sacramento, January 30th thru 31st, 2019 to talk directly with representatives. As demand for transparency on all foods and beverages continues to grow, STARS can guarantee stability and improve wine quality with zero additives and zero wine loss! A recent editorial by renowned French winemaker and researcher, Jean Luis Escudier outlined a major shift in European winemaking this year when the European Alcohol and Beverage Industry, in response to consumer demand for more transparency and following a series of meetings with the EU Commission, proposed a self-regulating agreement in which producers will list nutritional information and ingredients for their products. The introduction of this agreement could be an indication that change might slowly be coming to the world of winemaking with respect to transparency and producer accountability. Producers may soon be unable to hide behind Federal law (that does not require labeling for alcoholic beverages above 1.2% alc.) or claim to be “all natural” or “low intervention” when listing a long list of additives, including the one used during the stabilization process, on the back of their labels. Should the labeling law change, winemakers will either have to employ new methods of winemaking, that do not involve so many additives, or hope the more informed consumer will still buy their product. One non-additive solution winemakers could be embracing is STARS, the membrane electrodialysis technology that offers an additive-free stabilization method of winemaking. 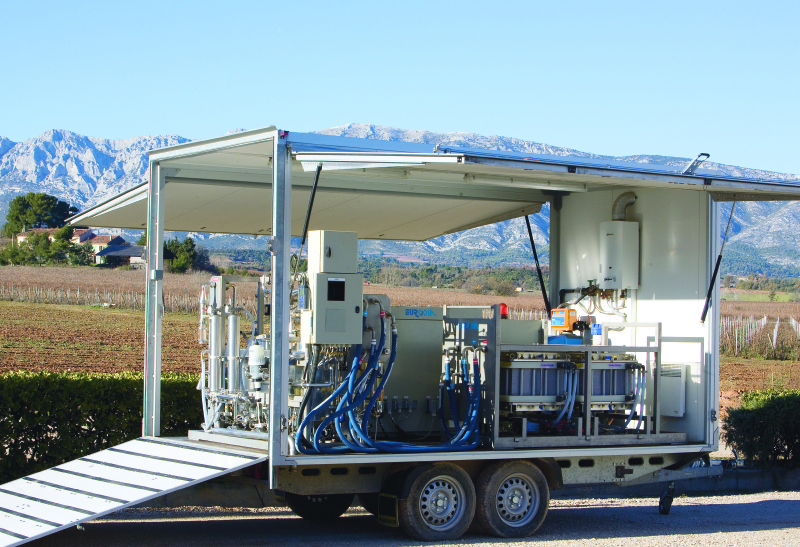 Membrane electrodialysis technology was developed by INRA (the French National Institute for Agricultural Research) and Oenodia and has been used in winemaking since 1997. STARS is a membrane process that uses a charged current to extract the anions and cations in the calcium and potassium ions. This leads to wine stability without the use of any additives or loss of wine and the process is in a closed system so no oxygen pickup occurs either. Oenodia attributes its success with STARS, not only to the ED technology but also to the development of the Stabilab, a test to measure the wine instability before treatment (DIT Test), provide a specific treatment number to get the wine stable at -4’ C and another test after treatment to check the wine and verify results (ISTC50 Test). The STARS system is the only 100% efficient stabilization method with no additives, no oxygen pickup, and zero wine loss that is on the market. Last year they added STARS XF to their STARS line which combines a crossflow filtration system with the original STARS system so you can stabilize and filter your wine at the same time. For more information, you can stop by the OENODIA booth #113 at WINEXPO on December 6th in Santa Rosa or at the UNIFIED Symposium, Booth #2406 in Sacramento, Jan 29th and 30th. Or you can visit us online at www.oenodia.us. Oenodia is the enology division of France’s Eurodia Industrie SAS, a groundbreaking specialist in liquid purification and filtration systems worldwide. Oenodia has developed a line of cutting-edge equipment for the Tartrate Stabilization and pH adjustment of wines, providing efficient, cost effective and sustainable solutions. These include its proprietary membrane-based technology, Electrodialysis (ED), as well as Crossflow Filtration and Reverse Osmosis. Oenodia is recognized as one of the world’s leading process solution suppliers dedicated to the wine industry. In North America, Oenodia has introduced its STARSline in many wineries, from large corporations to small & medium size wineries in both the US and Canada. In order to accelerate its growth in North America, Oenodia is now seeking a motivated, results-driven Sales Manager who will carry the responsibility of domestic US, Mexico and Canada sales. The successful candidate will have a strong working knowledge of the wine industry including equipment sales, a proven record for developing and implementing sales strategies, and a general understanding of what motivates customers to buy along with the skill set to effectively tap into those needs and desires. If you are competitive, motivated and wish to excel in technical sales in the flourishing wine industry, please come join our team. Create proposals and negotiate technical and financial terms based on customer needs and requirements. Napa, CA. June 1, 2018. Oenodia North America, a specialist in membrane-based treatments for the wine industry, is excited to announce it has been awarded the prestigious I+Q Award for Innovation. Oenodia, which is based in Napa, was honored specifically for its groundbreaking STARSXF technology which combines crossflow filtration with STARS for Tartrate Stabilization and pH Adjustment, without requiring an intermediate tank or multiple control functions, facilitating fast and automated processing. Oenodia is part of a select group of companies to receive this award in 2018. The I+Q Awards, which are part of the I+Q forum held annually in Napa, spotlight the most innovative products, services or processes for wineries. Each year products are hand selected by the I+Q Advisory Board and the Wine Business Monthly editorial team solely on the criteria of innovation that lends itself to high-quality, ultra-premium winemaking. This year’s winners received their awards at a ceremony following the Keynote at the 2018 I+Q on Thursday, May 23, in the Silverado Resort & Spa in Napa, California. STARSXF is offered exclusively by OENODIA and enables winemakers to continuously filter and stabilize their wines. Its cutting-edge automation requires only one (1) operator to run the two technologies. STARSXF operates best at room temperature. It does not require an additional filtration step and reduces wine loss from approximately 3% to an astonishing minimum of < 0.3% (Crossflow Microfiltration with STARS). The STARSXF technology is available through direct sales and through our STARS Mobile Service. For more information, visit us online at oenodia.us or call Benoit Murat at 707.742.0693. For STARS Mobile Service, contact Cliff Burmester at 707.287.7363. Brand new STARSXF Mobile Service Unit. At Oenodia, we are expanding our team to meet increasing demand for our industry leading services and technologies. We are currently hiring a Mobile Service Operator at our North American field office in Napa. This position provides a unique opportunity to learn cutting edge technologies for the wine industry; in addition to learning typical mobile service cellar and winery responsibilities. Mobile Service Operator – delivering Oenodia’s STARS related technologies to wineries across Northern California. STARS Mobile Service Operator reports directly to Mobile Service Manager. Mobile Service Operator, to provide STARSLine Mobile Services. Knowledge of general cellar practices, ability to drive truck and trailer. 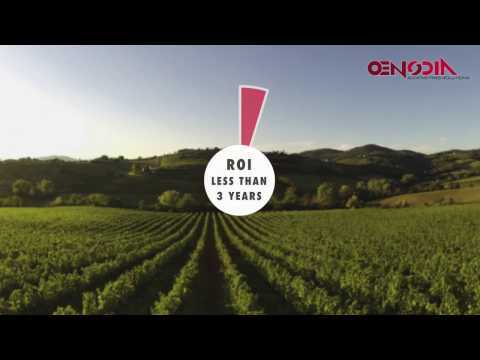 Based in Napa, CA, OENODIA is the oenology division of Eurodia Industrie S.A, (France) one of the world's leading specialists in membrane-based treatments for the agri-food industry. OENODIA®, provides membrane based eco-processes used for tartaric stabilization, acidification, de-acidification, cross-flow filtration of wines. STARSStab, which stands for Selective TArtrate Removal System, utilizes membrane-based, electrodialysis technology to deliver additive-free, sustainable, 100% guaranteed tartrate stabilization and pH adjustment for juice, red, rose and white wine. STARS Mobile Service delivers STARS technologies to wineries across Northern California. OENODIA rolls out their new STARS-XF Mobile Service, combining Crossflow Filtration with STARS-Stab technology, now available to California wineries. Oenodia North America, announces the arrival of their new, state of the art, STARSXF Mobile Service unit. The unit, which offers a Single-Pass, In-Line Filtration and Tartrate Stabilization process by allowing Crossflow Filtration (XF) and STARS systems to communicate with each other, is now available through Oenodia’s Mobile Service. Stop by Booth #357 at WiVi Central Coast and visit with the teams from both Electrotec and STARS Mobile Service. At the same time, check out the new STARS XF Mobile Service unit which combines Crossflow Filtration and STARS technologies. It will be on display in the open courtyard at the main entrance. OENODIA announces new partnership with Electrotec Mobile Services to provide STARSStab technology to the Central Coast. Oenodia North America, announces their new partnership with Electrotec Mobile Services to provide STARSStab for Tartrate Stabilization and pH Adjustment to wineries in the Central Coast. Based out of Paso Robles, Electrotec is an established mobile service provider offering a variety of services including metered Velcorin dosing and Crossflow Filtration. “We are excited to enter into this partnership with Oenodia and to add STARS to our services”, says Andre Austin, CEO of Electrotec. “This is a great technology that provides multiple opportunities for our customers to adjust pH and Tartrate stabilize their wines, which enhances wine quality, eliminates wine loss, saves time, energy and water, and requires no Additives. Electrotec will begin offering the service as of April 1st. Stop by Booth #357 at WiVi Central Coast and visit with the teams from both Electrotec and STARS Mobile Service. Check out the brand new STARSXF Mobile Service unit which combines Crossflow Filtration and STARS technologies. It will be on display in the open courtyard at the main entrance. Oenodia is one of the world’s leading specialists in membrane-based treatments with their STARSStab technology for fast, efficient Tartrate stabilization and pH Adjustment. Their newest addition to their STARS Line, STARSXF, provides an additional solution combining both Crossflow Microfiltration along with Tartrate stabilization in one single pass. The STARSStab technology utilizes Electrodialysis to safely stabilize wine with no additives improving wine quality and its sensory characteristics. It is based on controlled extraction of potassium, calcium, and tartrates through a charged membrane. STARSXF which pairs the STARSStab technology with Crossflow Microfiltration combines the best of both technologies into one single package to deliver a 100% stabilized, quality wine with minimal wine loss since no buffer tanks are required. “This technology is economical, ecologically friendly, and preserves the natural characteristics of the wine by not using any additives.” says Domingo Rodriguez, Oenodia’s Wine Business Manager for North America. “Oenodia North America just sold the largest STARSXF system, globally speaking, which sports two Crossflow filters, combined with a STARSStab unit, with a throughput capacity of 4,800gal/hour, expandable to 6,400gal/hour. STARSXF allows small, mid and large size wineries to better equip their production facilities to process and turn over product at a quicker rate with a known and guaranteed operating cost, while also saving on energy and labor costs and eliminating wine loss ” says Domingo Rodriguez. Small and medium sized wineries can also benefit from STARSStab and STARSXF since, in addition to the stationery equipment, Oenodia North America also provides STARS Mobile Service. Delivery of their newest mobile unit, featuring STARSXF is expected in late February. Winemakers who use this technology like it for a variety of reasons from the time and energy savings to reduced tank space as well as the quality of the final product. Oenodia North America will roll out the STARSXF mobile services in the coming months to California wineries. Visit the Oenodia booth #2506 at Unified Symposium to see how you can eliminate wine loss, save on time, energy, and labor costs while making your winery more efficient and delivering high-quality product to the market. Or visit us online at www.oenodia.us for more information. Raising the Bar for Innovative Technologies Across the Global Wine Industry One Bottle At A Time! 1.1 Billion Bottles of Wine Globally are Stabilized Using OENODIA STARS Technology! Since its inception, OENODIA, the enology division of France’s Eurodia Industrie SAS, one of the world’s leading specialists of liquid purification and filtration systems, has been on a path to revolutionize winemaking processes around the globe. The Oenodia journey began with the development of Electrodialysis aka ED, a membrane-based technology for tartrate stabilization of wine, which was accomplished in conjunction with engineers from the French-based Institut National de la Recherche Agronomique (INRA) in the early 1990’s. Electrodialysis (ED), better known now in the US as STARS™ (Selective Tartrate Removal System), is based on a controlled and measured extraction of potassium, calcium and tartrates, offering a single pass, tartrate stability guarantee and is an alternative to cold stability or additives such as CMC. The process, which is exclusive to Oenodia, has been lauded for its enhancement of sensory wine characteristics, wine loss elimination, absolute and guaranteed reliability, time and energy savings ability, continuous control over treatment, fixed operational costs, and high performance in both financial and environmental terms. Oenodia today has partners across five different continents and approximately 220 million gallons, or three percent of total global wine production, is stabilized using Oenodia’s STARS technology. Three percent may not sound like much, but that’s close to 91 million cases or 1.1 billion bottles of wine stabilized without precipitation, customer complaints or returns due to stability issues. According to Domingo Rodriquez, Oenodia’s Wine Business Manager for North America, the continual progression of the STARS technology across the STARS Line of equipment underscores the dedication of Oenodia’s Research and Development team, and their commitment to facilitating the final steps in the vinification process. Based on the innovative R&D efforts, and a natural evolution of STARS, Oenodia launched the comprehensive STARS-Line, which allows wineries to streamline the last steps before bottling and combine the following technologies: centrifuge, crossflow filtration, pH adjustment and tartrate stabilization into a single-pass system (STARSct, STARSxf, STARSph and STARSstab). In December, Oenodia North America will be releasing its new, state of the art STARS XF Mobile Service unit, capable of delivering the STARS/Crossflow Filtration combination in a single pass to wineries on site. Both systems can be coupled to stabilize and filter continuously or be used separately, according to specific winery production needs. For information and orders go to www.oenodia.us or call Domingo Rodriguez, Wine Business Manager at Oenodia North America 707-486-4651. STABILIZE YOUR CHARDONNAY IN A DAY! OENODIA’S STARS (Selective Tartrate Removal System) for TARTRATE STABILIZATION and pH ADJUSTMENT utilizes our exclusive, membrane-based Electrodialysis technology, to safely and effectively remove wine tartrates. Electrodialysis is the only process that can GUARANTEE 100% TARTRATE STABILITY, regardless of color, quality, quantity or level of wine instability. A few dates are still available but our Mobile calendar is filling up fast! CONTACT Cliff Burmester, STARS Mobile Service Coordinator for more information! Bernard Gillery, Founder and Chairman of Eurodia Industrie of France, and one of the originators in the development of the Electrodialysis processes for Tartrate Stabilization, was in Napa last week for the first OENODIA GLOBAL CONFERENCE (May 14-17). OENODIA, the Eurodia wine division which has a branch office in Napa, was created as a result of the development of an innovative solution for the Tartaric Stabilization of wine along with Monsieur Gillery's interest in developing a range of exclusive and highly effective solutions tailored to the winemaking industry. OENODIA and its eco-processes, which guarantee quality treatments without any additives; Tartaric Stabilization by Electrodialysis, as well as membrane-based pH and alcohol adjustment, now operate in 12 countries across 5 continents. Partners from across the globe will join Monsieur Gillery in Napa next week to discuss the future of OENODIA, the company’s continued growth, their ongoing commitment to Research & Development and the new technologies they have in the pipeline. In December of last year, OENODIA announced the introduction of their new STARS XF, which combines single pass Crossflow with STARS Tartaric Stabilization. STARS XF is part of their newly expanded STARS line, which also includes STARS Stab for Tartrate Stabilization, and STARS pH for pH Adjustment. Another KeyNote Speaker joining Mr Gillery at the Conference will be Jean Luis Escudier, renowned expert in enology and former Director of the experimental unit of Pech Rouge-INRA France where, in collaboration with the Joint Research Unit for "science for the oenology", Jean Luis was also involved in the development of the ED process which allows winemakers to eliminate the deposits in the wine while avoiding the addition of compound stabilizers. Bernard Gillery is the Founder & Chairman of Eurodia Industrie of France. Mr. Gillery is a Chemical Engineer with greater than 30 years of experience working with purification systems. Under Mr. Gillery's leadership Eurodia has become a world-leader in liquid purification industrial processes, generating over 35 million euros in income in 2016, serving preeminent customers in the Agro-food and Biotech industries worldwide. Eurodia was initially established for the design, manufacturing and sales of electro-dialysis stacks to industries in Dairy and Water sectors. Today, Eurodia has expanded its sales and services to include customized turnkey process solutions combining innovative technologies such as electro dialysis, chromatography, ion exchange systems, and membrane filtration. Don't forget to stop by and see us at Booth #326 at the Krug Winery, Napa Valley for IQ 2017. OENODIA technicians and staff will be on hand to provide information and answer any questions regarding STARS and the newest addition to their STARS Line.. STARS XF - which combines Crossflow Filtration & STARS. Find out more too about OENODIA's new state-of-the-art STARS Mobile Service unit, which features OENODIA’s Reverse Osmosis Technology for increased water savings of up to 70 percent. In addition, this latest model offers a throughput of 1600 gal/hr for an even faster service and has its own power generator for self-sufficiency. With two units now on the road, wineries of any size can access this technology through STARS Mobile Service. Oenodia, one of the world’s leading specialists in membrane-based treatments for the wine and agri-business communities, has initiated the next step in the evolution of wine processing by introducing their STARS-Line. The STARS-Line will offer a Single-Pass, In-Line Clarification, Filtration and Tartrate Stabilization process by allowing Centrifuge, Crossflow (XF) and STARS systems to communicate with each other. STARS-XF, which offers the Crossflow/STARS combination, is the first step of the evolution and is now exclusively available from Oenodia North America. STARS, which stands for Selective TArtrate Removal System, utilizes membrane-based, electrodialysis technology to deliver additive-free, sustainable, tartrate stabilization and pH adjustment for juice, red, rose and white wine. This technology is also available via STARS Mobile Services. The newest STARS-XF technology is a logical evolution in wine filtration. It facilitates the continuous crossflow filtration and tartrate stabilization of wines and eliminates the need for intermediate storage tanks or multiple control functions throughout the process. Rodriguez points out that this coupling of STARS and Crossflow Filtration through STARS-XF, combined with the specially designed control system, gives winemakers immediate benefits in terms of wine loss reduction, time and natural resources savings. Rodriguez also notes that demand for STARS tartrate stabilization and pH adjustment for both red and white wines has gone up dramatically of late. This increased demand has propelled OENODIA to develop and deliver a new and larger state-of-the-art STARS Mobile Service unit, specifically built for the North America market. The system features OENODIA’s Reverse Osmosis Technology for increased water savings of up to 70 percent. In addition, this latest model offers a throughput of 1600 gal/hr for an even faster service and has its own power generator for self-sufficiency. STARS, which stands for Selective Tartrate Removal System, utilizes membrane-based, electrodialysis technology to deliver additive-free, sustainable, tartrate stabilization and pH adjustment. This unique system avoids the time and expense incurred by cooling towers traditionally used in cold stabilization, and also eliminates wine losses and waste stream generation. The result is immediate, 100% guaranteed tartrate stability for a wine that’s ready for bottling in just one pass, ensuring wineries greater predictability for their bottling schedules. With two units now on the road, wineries of any size can access this technology through STARS Mobile Service. OENODIA will attend both the North Coast Wine Industry EXPO (BOOTH # 501) on December 1 in Santa Rosa and the Unified Wine & Grape Symposium (BOOTH # 2506) on January 24-26 in Sacramento. Visit the OENODIA booths at either show to find out more about permanent, sustainable wine stabilization solutions. Attendees at the North Coast Wine Industry EXPO can take also advantage of a 10 percent discount offer for the OENODIA Mobile Service, by booking on or before Jan 2, 2017. See #EXPODEALS for details. For more information on STARS Mobile Service, contact Cliff Burmester, STARS Mobile Service Coordinator, at 707-287-7363 or go to: www.oenodia.us. OENODIA relocates BENOIT MURAT to the US to provide TECHNICAL AND AFTER SALES SUPPORT for OENODIA North America. OENODIA North America is pleased to announce the appointment of Benoit Murat as their Technical and After-Sales Manager. Benoit, who has been relocated from France, brings with him a strong knowledge of OENODIA’s STARS line and their new emerging technologies as well as wide-spread experience in the wine industry. In his new position, Benoit will be responsible for overseeing all aspects of OENODIA North America’s Technical and After-sales division and will focus on continuing the delivery of quality equipment support and services. Benoit brings more than 19 years of wine industry experience to his new position. Originally from France, he received his degree in Winemaking at School Chateau La Tour Blanche in Bommes and his Masters in Winemaking at Toulouse. He gained experience and knowledge working in a variety of roles in wineries across the US and New Zealand before returning to France where he served as Winemaker at Chateau de Santenay in Burgundy from 2012. Benoit joined OENODIA in 2015 and has spent the last several months training under the European technical manager for his role in the US. You can contact Benoit at benoit.murat@oenodia.com or call 707.742.0693. DON’T WASTE TIME, WINE, ENERGY, WATER AND $$$ TO STABILIZE YOUR CHARDONNAY, USE STARS AND SAVE BIG! It’s that time of year when winemakers face the long, arduous process of stabilizing their Chardonnays prior to bottling. For decades, the only solution available was cold stabilization, which can take weeks, wastes enormous amounts of energy and water, and generates considerable wine losses. Today, however, there is a better solution: STARS. STARS MOBILE SERVICE offers a fast, reliable, guaranteed and effective solution for Tartrate stabilization, delivered right to your winery door. In addition, STARS allows you to gently dial-in your stability and sweet-spot pH and TA. With its single-pass process, you can complete your Tartrate stabilization in no time flat and eliminate wine losses. There’s no need for additives and you can curb water usage to about 3 - 5% of total wine stabilized. Last but not least, save 96% of energy compared to cold stabilization. What’s not to like?! OENODIA’S STARS (Selective Tartrate Removal System) for TARTRATE STABILIZATION and pH ADJUSTMENT utilizes our exclusive, membrane-based Electrodialysis technology, to safely and effectively remove wine tartrates. STARS has been proven to enhance wine quality, save power, eliminate wine loss and reduce water usage. Coming in July, just in time to stabilize and sweet-spot your wines (red or white), the all new, first of its kind, STARS MOBILE SERVICE vehicle featuring WASTE Water Recovery Technology. Stay tuned for more details. CONTACT Cliff Burmester, STARS Mobile Service Coordinatorat 707.287.7363 for more information and to book a place on our calendar. We look forward to working with you this summer! Register your interest in our STARS Mobile Service at the OENODIA Booth (#606) and you will be eligible to receive 10% OFF if you confirm your booking within 30 days of the show. Tartrate Stabilization via STARS Mobile Service delivered to your Winery door! Find out more about our sustainable membrane-based process, utilizing Electrodialysis, eliminating traditional cold stabilization and or additives. Must register at Oenodia Booth at WiVi show and bookings must be signed on or before April 17th, 2016 to receive discount.. Some restrictions apply. OENODIA has perfected a membrane-based process for Tartrate Stabilization and pH Adjustment eliminating waste, wine loss or additives, that can be delivered to wineries via mobile service. STARS (Selective Tartrate Removal System) uses membrane-based technology to safely and effectively remove wine Tartrates, while significantly reducing water consumption and saving up to 96% in energy costs. Rodriguez explains that the traditional method of Tartrate removal is done through cold stabilization, which uses old and inefficient refrigeration technology to chill tanks down to 28 degrees Fahrenheit for extended periods of time. Refrigeration technology uses evaporative chillers to cool down the tanks, and millions of gallons of water are wasted during the process. In essence, the California wine industry wastes up to 3.5 Million gallons of wine, 80 to 125 Million gallons of water and 330 Million kWh of energy every year by using outdated refrigeration technology. Rodriguez notes that companies using the STARS systems qualify for a significant PG&E utility rebate and that STARS technology received a “Flex Your Power” award for innovation in energy savings from the California Energy Commission. OENODIA, one of the world’s leading specialists in membrane-based treatments for the agri-food industry, has recently announced the opening of a Napa branch to support their growing presence in the North American wine industry. The expansion includes the addition of Cliff Burmester, the company’s STARS Mobile Service Coordinator. 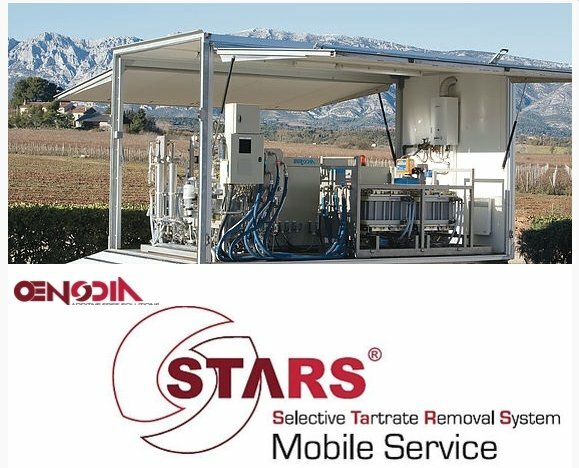 STARS Mobile Service brings OENODIA’s sustainable processes for tartrate stabilization and pH adjustment directly to wineries without the expense of installing a permanent unit on site. Burmester, who has an engineering background with 15 years experience in the wine industry, is excited about the launch of a new and expanded capacity STARS Mobile Service system. OENODIA will be in attendance at both the North Coast Wine Industry EXPO (BOOTH # 602) on December 3RD in Santa Rosa and UNIFIED Wine & Grape Symposium (BOOTHS # 1102 & 2002) on January 27 – 28th in Sacramento. Come along and find out more about our water-saving, zero waste sustainable solutions. OENODIA ANNOUNCES OPENING OF NAPA BRANCH TO SUPPORT THEIR GROWING PRESENCE IN NORTH AMERICAN WINE INDUSTRY! With growing demand amongst consumers to know more about what goes into the products they buy, as well as increasing geographical challenges such as water shortages, wineries are actively seeking greener techniques in their production line. Techniques that not only decrease their impact on the environment but also streamline their costs and improve wine quality. OENODIA’s sustainable processes for Tartaric Stabilization and pH Adjustment are leading the way in addressing many of these needs. Their STARS (Specific Tartrate Removal System) and STARS ZeroWaste have been proven to enhance wine quality, save between 80-96% of power usage, eliminate all wine loss, save 20-40% of water usage for Tartrate Stabilization, and they work with very large volumes. The increase in demand for their sustainable wine processing solutions has led to the announcement of a new OENODIA branch office, OENODIA NORTH AMERICA, which will be based out of Napa. The new location will provide direct support and service to the growing number of wineries utilizing STARS, ZeroWaste and the STARS Mobile Service (which delivers these solutions in a custom built mobile unit to your winery door). OENODIA is the oenology division of Eurodia Industries S.A, one of the world's leading specialists in membrane-based treatments for the agri-food industry. With its corporate headquarters in France, OENODIA delivers membrane-based sustainable technologies used for tartaric stabilization, acidification, de-acidification, cross-flow filtration and de-alcoholization of wines. Domingo Rodriguez, OENODIA’s North American Wine Business Manager and a 20-year wine industry veteran, has represented the OENODIA brand since 2010 and is leading the company's effort to better serve the North American wine industry’s growing interest in their innovative wine processes. OENODIA’s exclusive patented process for TARTRATE STABILIZATION, which utilizes Electrodialysis, a Zero Additive technique, can be acquired by purchasing STARS equipment directly or wineries can apply all the savings and the sustainable benefits by using the STARS Mobile Service which will now be operated and managed by Cliff Burmester directly out of the Napa office. Cliff, who has an engineering background, has 15 years of experience working in the wine industry including 12+ years with Winesecrets where he operated the STARS Mobile Service along with a variety of other innovative technologies for VA Removal, Alcohol Adjustment and Centrifuge. “I am delighted to join the OENODIA team and have their full support in delivering an all new and improved STARS Mobile Service” said Cliff. “With OENODIA’s investment in upgrades and new equipment we are going to be able to facilitate the smallest to the largest wineries with increased capacity and throughput for a rapid one pass 100% guarantee stabilization” he added. “Up to this point, our mobile service could operate at 800gal/hr but beginning in July 2016, we will be able to operate at 1600gal/hr and the addition of a Reverse Osmosis unit will decrease our water usage to about 3%. With the announcement of the opening of their new branch office in Napa plus new investment in equipment support and service, OENODIA’s commitment to the market and to their North American customers is solidified. OENODIA's new Napa office is located at 156 Camino Orugo, Suite 15, Napa, CA 94558. Contact the office at +1 707 486 4651 or domingo.rodriguez@oenodia.com . OENODIA will be in attendance at both the NORTH COAST WINE INDUSTRY EXPO (BOOTH # 602 on December 3RD in Santa Rosa and at UNIFIED Wine & Grape Symposium (BOOTHS # 1102 & 2002) on January 27 – 28th in Sacramento. Come along and find out more about our water-saving, zero waste sustainable solutions. Œnodia can guarantee complete and permanent stabilisation of wine, with no additives and with no adverse effects on its sensory characteristics. This is the result of its development of an innovative, novel and high-performance eco-process: stabilisation using electro-dialysis. Œnodia is currently the only company in the world able to successfully apply this process to wine. The result is 100% reliable tartaric stabilisation (down to -4°C over at least 6 days), irrespective of the colour or quality of the treated wine or of the storage conditions. Electrodialysis truly is a tool for sustainable development. It’s economical: the power consumption of a tartaric stabilisation unit is low: 0.2 kilowatts per hectolitre. That’s 8 to 10 times less than cold treatment. It’s Competitive: compared with similar treatments using cold, operating costs are 30 to 40% lower. Guarantee: It facilitates export sales by guaranteeing importers a fully stabilised product. It offers a high degree of reactivity, enabling fast, continuous, treatment. Finally it preserves the natural characteristics of the wine. • treatment without addition of chemicals. • no loss of product, no modification of sensory characteristics. • controlled technology, reliable, low energy and economical. Since its creation, Oenodia has developed its technologies with a simple philosophy: creating a more natural process and respect the environment. For several months, Oenodia has been working on the development of cleaner technologies and has finalized a “ZeroWaste” technology, featuring a low-impact process, saving you water and reducing effluents. Its principle is simple: the water used during wine tartrate stabilization is collected and reused multiple times. Simultaneously, tartrate crystals can be harvested and reused to produce Tartaric Acid. This value-added product can be re-used in the wine industry, cosmetic and or food processing industries. A perfect way for the wineries to recover their by-products. Oenodia’s research is now focused on optimizing the concentration and harvesting of tartrate crystals. Oenodia’s technologies, renowned for their reliability and their guaranteed results, have now reached the ZeroWaste goal: a sustainable solution based on an ecological and economical level! Cold Stabilize your wines and reduce water consumption below 1% while saving 96% energy and at least 0.5% of total wine volume stabilized! Continuous Crossflow Filtration & Tartrate Stabilization, micro filtration and tartrate stabilization in a continous, singl pas! Dial in your pH and Acidity sweet spot without using Tartaric Acid! For all of you who still believe STARS/Electrodialysis uses more water than Cold Stabilization; you are about ten years behind the latest technological developments. STARS/ED has for several years combined Reverse Osmosis technology to reduce waste water below levels generated by Cold Stabilization. Cold Stabilization uses, at best, about 5% water for tank cleaning while generating a good amount of Tartrate lese. At the same time, your chiller/evaporator system might blow as much as 40% of water into the atmosphere (% water is based on total wine volume stabilized). This translates to roughly 400,000 gallons of water for 1,000,000 wine gallons! Not including tank cleaning and Tartrate lese flushed down the drain. Since its creation, Oenodia has developed its technologies with a simple philosophy: creating a more natural process (no additives) while respecting the environment. Oenodia has been working on the development of cleaner technologies and has finalized a “ZeroWaste” STARS/ED application, featuring a low-impact process, reducing overall water usage for Tartrate stabilization to about 1% to 2%! Its principle is simple: using Reverse Osmosis technology, the water used during wine Tartrate stabilization via STARS is collected and reused multiple times. Simultaneously, Tartrate crystals can be harvested and reused to produce Tartaric Acid. This value-added product can be re-used in the wine industry, cosmetic and or food processing industries. A perfect way for the wineries to recover their waste. Oenodia’s research is now focused on optimizing the concentration and harvesting of Tartrate crystals. Oenodia’s technologies, renowned for their reliability and their guaranteed results, have now reached the “ZeroWaste” goal: a sustainable solution based on ecological and economical values and common sense! Stop Wasting Water and Time! We can help with our new “ZeroWaste” STARS technology! It consumes large amounts of water and takes forever. In addition, you lose wine ($$) and you release large amounts of waste into your waste stream. Find out about our new “ZeroWaste” STARS tartrate stabilization technology. Eliminate tartrate slurry and reduces water consumption below 1%! Reduce energy consumption by 96%! Recoup 1% to 2% of your wine! Save days and weeks of cold-hold time! Oenodia confirms its leading position in all international markets, with an increase in revenue of 30% and exciting future development opportunities. Today, Oenodia has 160 installations in 25 countries. The reason for this success is its tried and true technology, adopted by winemaking professionals around the globe and supported by a network of trusted partners. Following installations in Japan, Portugal, India and France, Russia has become Oenodia’s latest frontier in its business development, installing ED units for sparkling wine production. Oenodia offers Tartrate Stabilization via Electrodialysis which is a ZERO-Additive alternative, providing a 100% natural way to tartrate stabilize wine. ZERO wine loss, sustainable and energy efficient, Oenodia’s technology preserves wine quality and characteristics. Oenodia’s Electrodialysis always exceeds expectations of wine producers and winemakers who are looking for a reliable and guaranteed way to tartrate stabilize their wines. "Oenodia expects to double its market share over the next 10 years and is responding to requests for large-scale production units" says Yannick Le Gratiet, managing Director of Oenodia. The 26th International Exhibition (SITEVI) will be held at the “Parc des Expositions de Montpellier”. If you are visiting SITEVI, make sure you stop by our booth and pick up an invitation for our evening event. Oenodia will Exhibit at SITEVI during November 26, 27 and 28. Tartrate Stabilization without using additives for wine, grape juice and grape juice concentrate! Based on its leading role in membrane technology, Oenodia has applied and expanded its innovative membrane technologies to juice concentrate. Oenodia’s successful application of STARS/ED for Tartrate stabilization on juice has been successfully applied to juice concentrate in South America and Brazil. Oenodia’s sustainable Tartrate Stabilization of wine, juice and juice concentrate via Electrodialysis has addressed questions and expectations of producers worldwide looking for a reliable process without product loss and guaranteed results. Oenodia offers 100% guarantied Tartrate Stability without any additives while at the same time preserving the quality and integrity of the product. TA/pH sweet spotting? Want increased Mouth Feel? Dial in your wines tartrate stability with STARS while sweet-spotting your TA/pH balance. Improve your wines flavor profile by sweet-spotting TA/pH balance with STARS. To find out more, contact us at domingo.rodriguez@oenodia.com or call 707.486.4651. 2 completely refurbished 800 gal/h STARS/Electrodialysis units. Reduced pricing, plug and play installation! New & Used Equipment * Mobile Service * Rent-to-Own * Lease to Own options available. Waiting days or weeks to Tartrate stabilize your wines? Are You Stuck in “The Ice Age”? Get 1 month or more back in your year at no or low capital cost! Tartrate stabilization via 21st Century technology! Immediate and guaranteed tartrate stability at less than 8¢/gal. Start using STARS and save ¢15 to ¢35 per case. Smart, Legal, Sustainable and Cost Effective. Improve your wines flavor profile by sweet-spotting TA/pH balance. Dial in desired tartrate stability level and pH with STARS. To find out more, contact us at domingo.rodriguez@oenodia.com or call 707.486.4651. Oenodia’s eco-process uses membrane technology (STARS/Electrodialysis) to carry out wine pH adjustment (acidification) and Tartrate Stabilization. Removing the precursors that cause high pH (potassium) and Tartrate Instability (potassium and bi-tartrates) is safe, simple and easy. Most of all, it requires no additives to achieve the goal. pH: Electrodialysis with Bipolar Membranes reduces the pH of wine, grape must, and grape juice, without adding acids or using ion exchange resins. Developed by Eurodia Industrie S.A., and INRA, France, Electrodialysis/STARS reduces wine pH by 0.1 to 0.5 pH and juice pH by 0.3 to 0.8 pH units. Acidification is generated by a unique water-splitting process that occurs inside the Bipolar membrane. Bipolar membranes split water into H+ and OH ions. The wine is acidified by the H+, and potassium is transported across a cation transfer-membrane. Elimination of wine loss and preservation of wine integrity including wine flavor, are the Hallmarks of Electrodialysis/STARS. 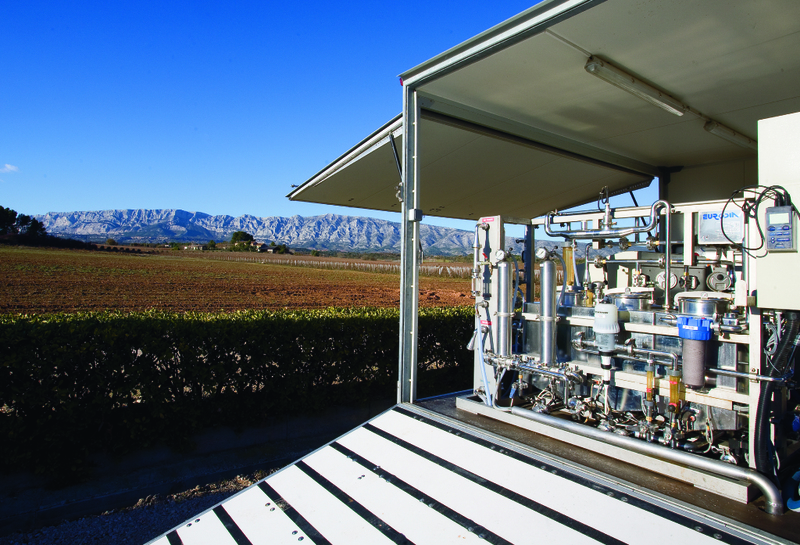 Bipolar technology dramatically reduces water consumption and high-salt effluent produced during wine or juice acidification via ion exchange resins. Once removed, the potassium (K+) combines with the OH- from the water splitting reaction. The KOH stream, at a pH of 12, is concentrated using an RO based recycling system, The concentrated effluent is ideal for cleaning winery equipment, or may be re-used in other industries. Save energy and $0.15 to $0.35 per case by using STARS/ED technology. Our 2012 models are on sale until the end of this month. Take advantage of reduced prices and 2012 tax deductions. Only 1 ED800 unit left: Our bestselling STARS/Electrodialysis unit, ED800 (800 gal/h – 2MM+ gal/year) is ready to be placed at your winery and start saving you $$ and energy. Call (707) 486 4651 or email domingo.rodriguez@oenodia.com to take advantage of the low prices for your year-end purchases. STARS / Electrodialysis – JOIN THE SUSTAINABLE MOVEMENT! Oenodia’s STARS/Electrodialysissystem is the only immediate, comprehensive and guaranteed solution for Tartrate Stabilization of red, rose and white wines. STARS/Electrodialysis: Cost Effective, No Additives, Gentle, Single Pass, Guaranteed, No Oxygen Pick-Up, Improved Quality! Is Marketing asking you to release your wines sooner… like yesterday? Do you already know your wines are not stable and you don’t want or can't wait 3 to 6 weeks? Is your bottling schedule being thrown off due to tartrate unstable wines? Are you worried that your wines will not be stable when shipping to "cooler" markets/regions? Oenodia provides Sales, Mobile Service, Long Term Rental and Leases of STARS/Electrodialysis equipment. 800 gal/hr. to 3,200 gal/hr. 16,000 gal/24hr. to 64,000 gal/24hr. OENODIA, EURODIA Industrie’s global wine division provides membrane processes to the wine industry, including Tartrate Stabilization and pH Adjustment via STARS/Electrodialysis, water reclamation via Reverse Osmosis, Ceramic Crossflow Microfiltration and Alcohol Adjustment via Memstar. OENODIA now introduces a complete treatment process for wines before bottling - MEMSTAB®. MEMSTAB® allows continuous Crossflow Microfiltration and Tartrate Stabilization of wine without requiring an intermediate tank or multiple control functions, facilitating fast and automated processing. By coupling these technologies, MEMSTAB® combines all the well-known advantages of both technologies in a single package, improving oenological quality and operational aspects, saving time, increasing operational flexibility, saving water, saving energy and minimizing wine losses by up to 3% of total wine processed. OENODIA’s years of investment in Research & Development to minimize fouling of various membranes used in pre-bottling wine has provided breakthrough results. Crossflow Microfiltration, applied to wine for many years, has become the preferred technology for pre-bottling wine filtration and STARS/Electrodialysis. However, until OENODIA’s involvement, none of the Crossflow equipment was able to be adapted to STARS/Electrodialysis. STARS/Electrodialysis works at a constant and continuous flow rate, compared to Crossflow Microfiltration, which has a flow rate that always decreases due to membrane fouling. OENODIA’s newly chosen ceramic crossflow membrane was selected specifically because of the low affinity for wine compounds (phenolic compounds, sugar, proteins). Since the selected membrane is not affected by wine composition, particles and wine compounds will not stick to the membrane and thus greatly reduce membrane fouling. The combination of the two technologies and a specially designed control system allowing the two technologies to communicate, making MEMSTAB a highly effective winemaking tool. Wine is naturally rich in particles and can be tartrate unstable. Musts naturally contain micro-organisms (yeasts, bacteria, fungi) coming from the grapes. Yeasts, better adapted to growth in grape must, will grow rapidly and allow alcoholic fermentation. Depending on the type of wine, the development of lactic bacteria will be favored or inhibited (malolactic fermentation). Acetic bacteria are always present at a very low concentration and are responsible for the formation of acetic acid and other volatile components. In addition to the micro-organisms and the products of their autolysis, we can find some remains from the grape, some colloidal aggregates, and tartrate crystals. Wine naturally contains an excess of tartrate and potassium ions that tend to precipitate together to form Tartrate crystals. Traditional techniques for clarification and stabilization of wines involved a series of successive separation processes: to remove particles (Diatomaceous earth filtration, membranes, centrifugation) and to avoid crystallization in the bottle (cold treatment and or additions of chemicals). The MEMSTAB® process developed by OENODIA is a 100% membrane-based process, which couples Ceramic Crossflow Microfiltration and Tartrate Stabilization via STARS/Electrodialysis. MEMSTAB’s continuous treatment, without need for intermediate storage, can be fully automated and allows the simultaneous clarification, microbiological stabilization and tartrate stabilization of wines. MEMSTAB’s two main components (Ceramic Crossflow & STARS/Electrodialysis) can also be used as stand-alone units. MEMSTAB brings major advantages to wine processing, not only for oenological quality considerations but also for all its operational aspects, , saving water, saving energy and minimizing wine losses by up to 3% of total wine processed. Unlike depth filtration, where particles gradually accumulate on the membrane surface (Figure 1a), Crossflow Microfiltration (Figure 1b) limits the formation of deposits. The wine circulates in a loop, part of which is composed of membrane. Wine and particles are moving tangentially to the membrane. Part of the liquid goes through the membrane under the low pressure gradient (permeate) while the liquid and particles that have not crossed the membrane continue their way in the circulation loop (retentate). The wine crossflow velocity in the retentate loop limits the deposit of particles on the membranes’ surface. Particles are concentrated in the circulation loop. By its implementation, crossflow microfilration can achieve, in one step, the clarification and the microbiological stabilization of the wine. It does not require the use of consumables, essential to conventional filtration methods (pads, cartridges Diatomaceous earth, Crossflow Microfiltration reduces the amount of waste generated during filtration, as well as its large product losses. The selection of membrane materials that are suitable for wine - with very little affinity for dissolved compounds (phenolic compounds, polysaccharides) - and the optimization of hydrodynamic conditions led to the development of a technology that works at constant flow and can be easily coupled with STARS/Electrodialysis. STARS/Electrodialysis (ED) eliminates the need for bulk refrigeration or any chemical additions. It is a membrane-based process that uses an electric field and selective ion exchange membranes to remove ions from a solution. The ED stack used for the tartaric stabilization of wines consists of alternating cationic and anionic membranes (Figure 2). An electric current applied between two electrodes allows the extraction of the tartrate anions, as well as the potassium and calcium cations from the wine. This happens because the tartrate anions (TH-) with a negative charge migrate toward the positive electrode (anode) into the brine/conductant loop. They cross the anionic membrane and are rejected by the cationic membrane. Similarly, potassium (K+) and calcium (Ca2+) cations that are positively charged migrate towards the negative electrode (cathode) by crossing the cationic membrane and are rejected by the anionic membrane and carried away by the brine/conductant. The concentration of tartrate, potassium and calcium is reduced in the wine making it tartrate stable. Coupling STARS/Electrodialysis and Ceramic Crossflow Microfiltration is a unique, important and logical evolution in wine processing. It is the only automated single pass and single treatment to get the wine bottle ready. Cellar and bottling schedules are optimized; requirements for tank storage greatly decreased, wine movement reduced, oxygen pick up eliminated, water consumption lowered and 96% of your energy for cold stabilization saved. MEMSTAB operates best at room temperature. It does not require an additional filtration step and reduces wine loss from approximately 3% to an astonishing minimum of < 0.3% (Crossflow Microfiltration & STARS/ Electrodialysis). OENODIA has been working for years to minimize the quick fouling of the various membranes used in wine filtration before bottling. Cross-flow filtration has been applied to wine for many years, but until OENODIA’s involvement, none of the equipment can be adapted to Electrodialysis processing because Electrodialysis works at a constant flow rate and the filtration flow rate always decreases due to membrane fouling. Thanks to OENODIA’s R&D, a new type of filtration membrane was selected with a very low affinity to wine compounds (essentially the phenolic compounds, sugar and proteins). Since the selected membranes are not affected by the composition of the wine, particles and wine compounds will not stick to the membrane and fouling is thus greatly reduced. Together with a back-pulse system and a good monitoring system, the combination of the two techniques is very effective. OENODIA will provide technical assistance with the supply of any membrane system. Our company is staffed with a team of oenology engineers who work with our customers to provide the most adequate solutions to optimize the implementation of its processes. Memstab ® n line coupling of Wine Cross-Flow Microfiltration and Tartrate Stabilization. Wine is naturally rich in particles and not stable regarding tartrate precipitation. Musts naturally contain micro-organisms (yeasts, bacteria, fungi) that are coming from the grapes. Yeasts, better adapted to growth in grape must, will grow rapidly and allow the alcoholic fermentation. Depending on the type of wine, the development of lactic bacteria will be favored or inhibited (malolactic fermentation). Acetic bacteria are always present at a very low concentration and are responsible for the acetic fermentation. In addition to the Micro-organisms and the products of their autolysis, we can find some debris from the grape, some colloidal aggregates, and tartrate crystals. Wine contains (naturally) an excess of tartrate and potassium ions that tend to precipitate together to form tartarte crystals. The standard techniques for the clarification and stabilization of wines involve a series of successive separation processes: to remove particles (Diatomaceous earth filtration, membranes, centrifugation) and to prevent crystallization (cold treatment, chemical add-on). The MEMSTAB® process developed by OENODIA is a 100% membrane process, which combines (in line) crossflow filtration and tartrate stabilization by Electrodialysis. This continuous treatment, without intermediate storage, can be fully automated and allows (simultaneously) the clarification, the microbiological stabilization, and the tartrate stabilization of wines. This combined technology brings major advantages to wine treatment, not only for oenological quality considerations but also for all its industrial aspects (time savings, increasing processing flexibility, and minimizing wine losses). Unlike depth filtration, where particles gradually accumulate onto the membrane, crossflow filtration limits the formation of deposits. The wine circulates in a loop, part of which is composed of membrane. Wine and particles are moving tangentially to the membrane. Part of the liquid goes through the membrane under the pressure gradient (permeate) while the liquid and particles that have not crossed the membrane continue their way in the circulation loop (retentate). The wine crossflow velocity in the retentate loop limits the deposit of particles on the membrane’s surface. Particles are concentrated in the circulation loop. By its implementation, cross flow microfilration can achieve, in one step, the clarification and the microbiological stabilization of the wine. It does not require the use of consumables, essential to conventional filtration methods (plates, Kieselguhr) and reduces the amount of waste generated during these operations, as well as the product losses. The selection of membrane materials that are suitable for wine - with very little affinity for dissolved compounds (phenolic compounds, polysaccharides) - and the optimization of hydrodynamic conditions led to the development of a technology that works at constant flow and can be easily coupled with Electrodialysis. Electrodialysis (ED) is a membrane process that uses an electric field and selective ion exchange membranes to remove ions from a solution. The ED stack used for the tartaric stabilization of wines consists of alternating cationic and anionic membranes (Figure 2). An electric current applied between two electrodes allows the extraction of the tartrate anions, as well as the potassium and calcium cations from the wine. This happens because the tartrate anions (TH-) with a negative charge migrate toward the positive electrode (anode) into the brine loop. They cross the anionic membrane and are stopped by the cationic membrane. Similarly, potassium (K+) and calcium (Ca2+) cations that are positively charged, migrate towards the negative electrode (cathode) by crossing the cationic membrane and are stopped by the anionic membrane. The concentration of tatrate, potassium and calcium is reduced in the wine and it becomes stable as far as tartrate precipitation is concerned. Electrodialysis applied to wine has been developed and patented jointly by INRA (the French National Institute of Food Research) and Eurodia Industrie SA. Oenodia has developed a new eco-process which uses membranes to carry out acidification (also known as pH adjustment) of wines. “For acidification, we’ve once again opted for Electrodialysis, a natural way to improve quality” explains Yannick Le Gratiet, Director of Oenodia, division of Eurodia Industrie. Electrodialysis with Bipolar Membranes (Bipolar ED) reduces the pH of wine, grape must, and grape juice without adding acids or using ion exchange resins. Developed by Eurodia Industrie in France, Bipolar ED reduces pH of wines by 0.1 to 0.5 pH units, and juice by 0.3 to 0.8 pH units. The acidity is generated by a unique water-splitting process that occurs inside the bipolar membrane. Bipolar membranes split water into H+ and OH ions. The wine is acidified by the H+, and potassium is transported across a cation transfer-membrane. pH reduction using Bipolar ED preserves the integrity of the product since nothing is added to the wine and there is no loss of product. Bipolar ED dramatically reduces water consumption and high-salt effluent produced during the acidification of wine or juice with ion exchange resins. Once removed, the potassium combines with the OH- from the water splitting reaction. The KOH stream, at a pH of 12, is concentrated using an RO based recycling system, The concentrated effluent is ideal for cleaning winery equipment, or may be re-used in other industries. If you are interested in this new and exciting technology, please contact us at drodriguez@ameridia.com or call us at +707.486.4651. At Vinitech, International Tradeshow for Vineyard and Winemaking as well as Agricultural aspects such as Fruits and Vegetables, EURODIA, one of the first companies to globally provide membrane technologies to the Food and Agro Industry, is announcing to the press and the wine industry professionals its new department, OENODIA, dedicated solely to the global wine industry. Yannick Le Gratiet, Winemaker and Director of OENODIA (Director of Oenology Department), under the supervision of Bernard Gillery, President and Founder of EURODIA, OENODIA currently supervises all aspects of the “Wine Business” i.e., Engineering, Commercialization, Production and Maintenance. The purpose of OENODIA reflects EURODIA’S ambitions to provide its unparalleled technologies to the global wine industry. OENODIA already realizes annual revenues of € 5 million and is expected to grow due to its increasing presence in the wine industry. OENODIA is represented in the main wine producing countries such as France, Spain, Italy, USA, Australia, New Zealand, Chile and Argentina, with over 15 years of experience, a solid reputation and excellent product integrity. In the mid-1990, EURODIA started the collaboration with INRA (French National Research Institute for Agricultural Research) to provide the global wine industry with an exclusive, innovative and reliable solution. No additions are needed, 100% predictable and reliable, respects the wine integrity, saves energy and eliminates wine loss, when compared to traditional cold stabilization. This technology, developed and patented by EURODIA and INRA is currently used to stabilize 3% of the global wine production, and growing. Wine producers and consumers are demanding ever increasingly, quality and product integrity, which is OENODIA’s main purpose. EURODIA’S oenology department is increasing the commercialization of two new membrane based wine applications, dedicated at acidification and de-alcoholization of wines, responding anew to ever increasing demands of the wine industry, due to climate changes and consumer trends. By doing so, EURODIA is once again providing technology that eliminates additions and provides 100% product integrity and customer satisfaction. EURODIA Industrie, based in Pertuis, France, one of the first companies to globally provide membrane technologies to the Food and Agro industry, was founded in 1988 by Bernard Gillery (President) and is held by the Japanese group “Tokuyama”, who manufacturers Electrodialysis membranes. EURODIA has a Division in the United States of America, AMERIDIA, and offices in China and Russia which complement its many resources, agents and licensed distributors covering 5 continents. In addition to the “Wine Business”, EURODIA is also leading the way in sugar, dairy and chees industries and offers innovative processes to produce new chemical molecules for renewable resources (Green Chemicals). Sales revenues for 2010 are projected at € 24 million. Yannick Le Gratiet, Winemaker and Director of OENODIA (Director of Oenology Department), under the supervision of Bernard Gillery, President and Founder of EURODIA, OENODIA currently supervises all aspects of the “Wine Business” i.e., Engineering, Commercialization, Production and Maintenance. The purpose of OENODIA reflects EURODIA’S ambitions to provide its unparalleled technologies to the global wine industry. OENODIA already realizes an annual revenue of € 5 million and is expected to grow due to its increasing presence in the wine industry. OENODIA is represented in the main wine producing countries such as France, Spain, Italy, USA, Australia, New Zealand, Chile and Argentina, with over 15 years of experience, a solid reputation and excellent product integrity.
" Using STARS Electrodialysis for cold stabilization of sparkling base wines offers Domaine Chandon several advantages over the conventional method of deep chilling the wine to force tartrate precipitation. First, important in moving towards Green technologies, is the conservation of recourses offered by greatly reducing energy needs, both electricity for operating the chilling equipment and natural gas needed in heat exchanging the sparkling base wine back up to temperature for second fermentation in the bottle. Also conserved is the significant amount of wine that would otherwise be lost in the tartaric acid slurry resulting from the conventional method. Additionally, no longer an issue is the lost wine and tartaric acid that had been going down the drain, loading the winery's waste treatment facilities. Of course, when precipitating acid from the wine, the wine can go out of structural balance, necessitating the addition of tartaric acid before starting conventional cold stabilization, with STARS our need for supplemental tartaric acid has dropped significantly. Throughout the process there is labor cost savings from no longer needing man-hours to stage tanks for batch process cold stability, filtering out tartrates, cleaning the tartrate crusted tanks and heat exchanging to warm the super chilled wine. Finally, a most important, but hard to quantify in terms of cost benefit, is improvement towards production logistics: With conventional cold stabilization process it can be challenging to predict exactly when a wine can be ready for bottling, however, with Electrodialysis, production planning can be precise. " " As winner of the International Winemaker of the Year award at the IWSC in 2001, our company is very serious about wine quality we have found that ED (Electrodialysis) has given us an advantage not only in quality, but also in our strive to be more environmentally responsible. "